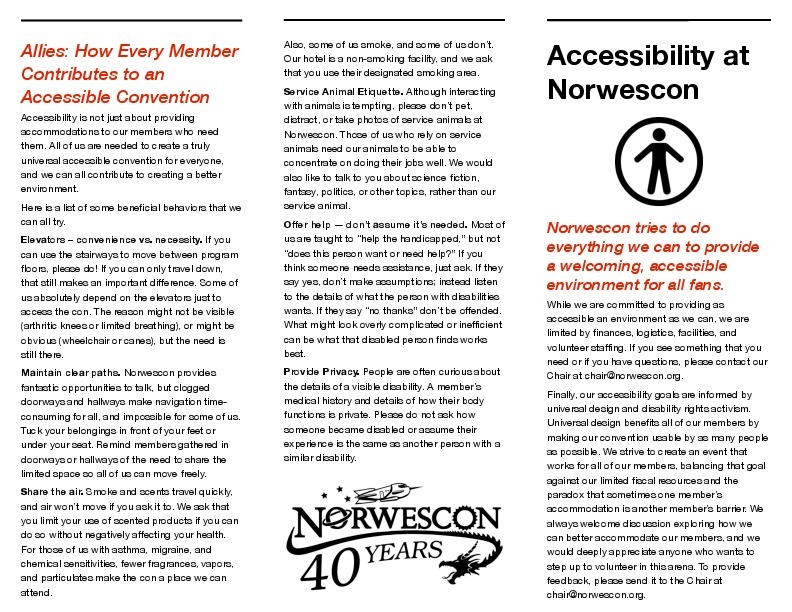 Norwescon tries to do everything we can to provide a welcoming, accessible environment for all fans. While we are committed to providing as accessible an environment as we can, we are limited by finances, logistics, facilities, and volunteer staffing. 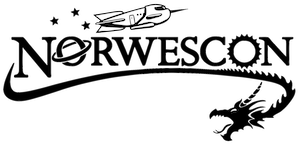 If you see something that you need or if you have questions, please contact our Chair at chair@norwescon.org. Finally, our accessibility goals are informed by universal design and disability rights activism. Universal design benefits all of our members by making our convention usable by as many people as possible. We strive to create an event that works for all of our members, balancing that goal against our limited fiscal resources and the paradox that sometimes one member’s accommodation is another member’s barrier. We always welcome discussion exploring how we can better accommodate our members, and we would deeply appreciate anyone who wants to step up to volunteer in this arena. To provide feedback, please send it to the Chair at chair@norwescon.org. If you need an ADA compliant/accessible hotel room, please contact the Hotel directly when you make your reservation. The Hotel does have a limited number of these rooms so please only request this type of room if you truly need one. These rooms are located throughout the Hotel including out in the wings of the building. If distance is a factor in your abilities, please mention that to the Hotel representative. Mini-fridges can also be requested from the Hotel if you need one for your medications. Again, please contact the Hotel directly to arrange for one if you need one. Be sure to specify that it is for an ADA reason, and they will accommodate you. All tower rooms have mini-fridges. The DoubleTree by Hilton offers a shuttle service from the SeaTac airport to their facility. With advance notice, they can provide an accessible shuttle. Please contact the Hotel directly at +1-206-246-8600 to request this service. The Hotel has two banks of elevators to access programming spaces. The main set of elevators is in the Tower and will take you from the Lobby to the Cascade programming rooms as well as to all rooms located in the Tower and Maxi’s Ballroom. Programming also occurs in the Evergreen rooms, which are accessible by another elevator bank. This elevator bank is in the back hallways of the Hotel. While there are signs pointing the way, feel free to ask anybody you see with a Staff T-shirt for directions. Do you have food allergies? The Hotel has a special process in all of their restaurants to minimize your exposure to potential allergens. Please ask your server for a red ticket, which will signal the kitchen that your food requires special preparation. We also provide some food in our Hospitality area. While we attempt to label the allergens in our food, please ask if you have any questions. Our Hospitality area is not a nut-free zone. We also cannot guarantee that there is no cross contamination for gluten. All of our lines will have chairs scattered throughout the line if you need to sit down. If all of the seats are taken, we will have volunteers in Staff shirts going through the line. Please alert one of them, and they will help you with an accommodation. Additionally, if you have limited mobility, please let us know, and you may be able to wait near the front of the line as well. Each panel room has taped off wheelchair/scooter seating and front-of-room seating for heard of hearing of visually impaired members available on a first-come, first-served basis. For our bigger events in the Grand Ballrooms, each event will have marked off seating. If you need accessible seating for one of these events, please let one of our Staff know. Accessible seating is available on a first-come, first-served basis. In addition to the marked off seating, we can also accommodate wheelchairs or scooters by moving chairs. Again, please ask for assistance. The convention can frequently be a noisy, stimulating place. We do not have a specific quiet room available for members, but there are some areas of the convention that are quieter than others if you do not have a room in the Hotel. Our convention lounge does have a separate room that can sometimes be crowded but tends to have a low-key, quieter atmosphere for people to re-charge. Other quiet areas can be found by going up. Comfortable furniture (couches and chairs) has been set up on the 2nd and 3rd floors of Wing 7. If you require ASL translation, please contact the Chair at chair@norwescon.org so that we can arrange an interpreter. We request three (3) week notice prior to the convention. Service animals are allowed in our Hotel. We ask that you please consider having your service animal wear something identifying them as a service animal. Our programming spaces can be crowded and that identification can help other members treat your service animal appropriately. For everyone else, please assume that if you see an animal at the convention that it is a service animal. It is very important that you do not interfere with their job by interacting with them. Thanks! Have we not addressed your concern with this FAQ? Please let us know by emailing the Chair at chair@norwescon.org with your question or concern. Just because it is not mentioned here does not mean that we cannot potentially accommodate you. Accessibility is not just about providing accommodations to our members who need them. All of us are needed to create a truly universal accessible convention for everyone, and we can all contribute to creating a better environment. Here is a list of some beneficial behaviors that we can all try. Elevators – convenience vs. necessity. If you can use the stairways to move between program floors, please do! If you can only travel down, that still makes an important difference. Some of us absolutely depend on the elevators just to access the con. The reason might not be visible (arthritic knees or limited breathing), or might be obvious (wheelchair or canes), but the need is still there. Maintain clear paths. Norwescon provides fantastic opportunities to talk, but clogged doorways and hallways make navigation time-consuming for all, and impossible for some of us. Tuck your belongings in front of your feet or under your seat. Remind members gathered in doorways or hallways of the need to share the limited space so all of us can move freely. Share the air. Smoke and scents travel quickly, and air won’t move if you ask it to. We ask that you limit your use of scented products if you can do so without negatively affecting your health. For those of us with asthma, migraine, and chemical sensitivities, fewer fragrances, vapors, and particulates make the con a place we can attend. Also, some of us smoke, and some of us don’t. Our hotel is a non-smoking facility, and we ask that you use their designated smoking area. Service Animal Etiquette. Although interacting with animals is tempting, please don’t pet, distract, or take photos of service animals at Norwescon. Those of us who rely on service animals need our animals to be able to concentrate on doing their jobs well. We would also like to talk to you about science fiction, fantasy, politics, or other topics, rather than our service animal. Offer help — don’t assume it’s needed. Most of us are taught to “help the handicapped,” but not “does this person want or need help?” If you think someone needs assistance, just ask. If they say yes, don’t make assumptions; instead listen to the details of what the person with disabilities wants. If they say “no thanks” don’t be offended. What might look overly complicated or inefficient can be what that disabled person finds works best. Provide Privacy. People are often curious about the details of a visible disability. A member’s medical history and details of how their body functions is private. Please do not ask how someone became disabled or assume their experience is the same as another person with a similar disability. Katharine Bond, “Norwescon 40 Accessibility Brochure,” Norwescon History, accessed April 20, 2019, http://history.norwescon.org/items/show/318.